The latest trend to hit the streets of Sydney! Our super fun, contemporary flower arrangement features nine mixed roses in hot pink, bright yellow and vibrant orange. 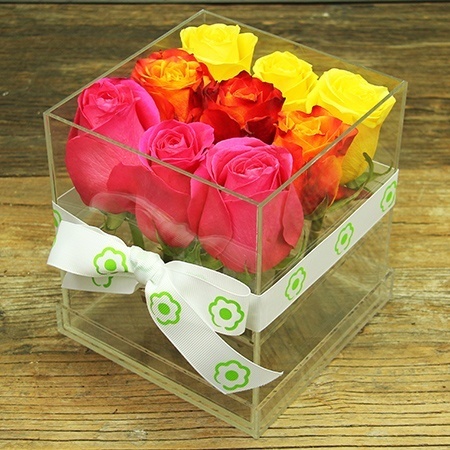 Designed with the modern woman or man in mind, these modern perspex (re-usable) cubes of fresh roses in colourful tutti frutti tones is a fab way to wish someone a happy birthday, say thanks, send a congrats or wish someone a get-well-soon. Order your bright coloured roses delivered in Sydney online or give our team a call on 1800 66 66 46! Ps. These roses are the perfect match for our super scrumptious freckle milk chocolate bar available from our range of quality gift add ons!